SAN DIEGO — Anglers are invited to fish for a cause on a 92-foot sportfishing boat during Fish. Food. Feel Good’s (F3G’s) Fishing for Charity event, Aug. 6-8. Held in partnership with Meals on Wheels of Greater San Diego, the fishing trip is designed to raise close to $20,000 and reel in enough fish to feed San Diegans in need. Participating sport anglers will spend the day fishing aboard the sportfishing boat Shogun. F3G is a San Diego 501 nonprofit organization founded on a mission to collect excess fish from sport anglers and distribute them to local charities who serve Americans in need. Albacore, yellowfin tuna, bluefin tuna, wahoo, dorado and yellowtail are some of the types of fish that the organization has donated to local charities in the past. Anglers have a chance to contribute to the cause when they sign up for the upcoming August trip. Once aboard Shogun, a 92-foot luxury sportfisher with an onboard chef, the group will fish south of San Diego. On Aug. 6, 28 anglers will head out at dusk and return Aug. 8. 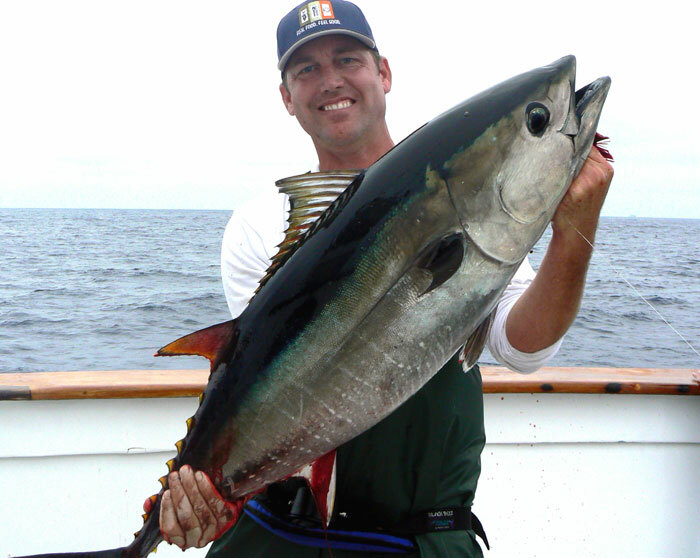 They hope to come back with as many fish as they did in 2011, when anglers reeled in 110 large bluefin tuna and 26 yellowfin tuna, along with dorado and yellowtail catches. “It was the best 1.5-day trip I’d ever been on, and the best 1.5-day trip for the entire fleet that year,” Bluechel remembered. He added that he hopes to have that same luck this coming August. This past year, Meals on Wheels has been the recipient of almost 15,000 pounds of sushi-grade fish, providing protein for 30,000 meals. According to F3G, anglers will help the organization raise critical funds, matching a title sponsorship from Sycuan Casino in the amount of $10,000, by using personalized fundraising pages. Participating anglers will ask their friends, family and community to support the event by sponsoring them with a direct donation in support of their effort. To make donations or get more information, visit f3g.org. Other charities benefiting from F3G donations include Father Joe’s Villages, San Diego Rescue Mission, Samoa Independent and San Diego Food Bank.